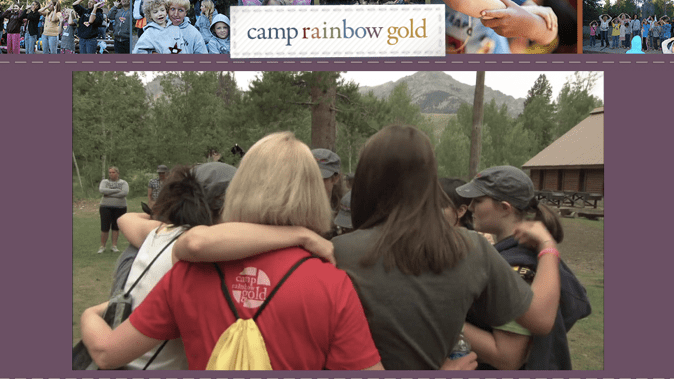 Camp Rainbow Gold – Support Camps for Kids with Cancer! We wanted to take a break from the deals today & share with you about a kids camp located here in the Northwest, in Boise, Idaho. Camp Rainbow Gold started back in the 1980’s as a summer camp for kids struggling with cancer so they could experience the fun of camping in a place equipped to handle their medical needs. Camp Rainbow Gold has now grown to providing services to both children with cancer as well as their families throughout the entire year. It helps to give them a place to feel supported and like a regular kid, while meeting other kids & families going thru the same thing they are going through. Recently, the American Cancer Society made the decision to redirect funding for these summer camps for cancer patients and instead focus more on research and the expenses for finding a cure for cancer. While this is of the utmost importance to find a cure for cancer, it does leave camps such as Camp Rainbow Gold without the resources they need to keep operating. Camp Rainbow Gold is a non-profit group and it does not cost anything for the kids to attend the camp, but it does cost approximately $1500 per child to attend the camp. Without the funding support of the American Cancer Society, camps such as Camp Rainbow Gold are solely reliant on individual & business support to stay open for these kids. We don’t normally post about opportunities like this just because there are so many wonderful organizations out there and we couldn’t share about them all, but this is one that we wanted to share around Christmastime as you consider ways for your family to be able to give this holiday season. Find out more by watching this video about Camp Rainbow Gold and find out how you can help send a child with cancer to camp!